With the win over the Indians, the Spartans improve to 4-4 in Northwest Oregon Conference play. Hillsboro's inside-outside weaponry held off a game effort by Scappoose in Northwest Oregon Conference girls basketball play Friday night. Rian Porter, Hillsboro's 6-0 junior post, had a game-high 19 points and team-best 10 rebounds as her team won at home, 57-42 on Feb. 1. The Spartans also got a combined 32 points from guards Kylie Fernstrom and Dylan Kem. Fernstrom, a 5-7 junior, made three 3-pointers en route to 17 points. Kem, a 5-5 sophomore, sank four shots from beyond the arc in scoring 15 points. "Rian had a good game inside, and we were hitting from outside," Hillsboro coach Sara Harsin said. 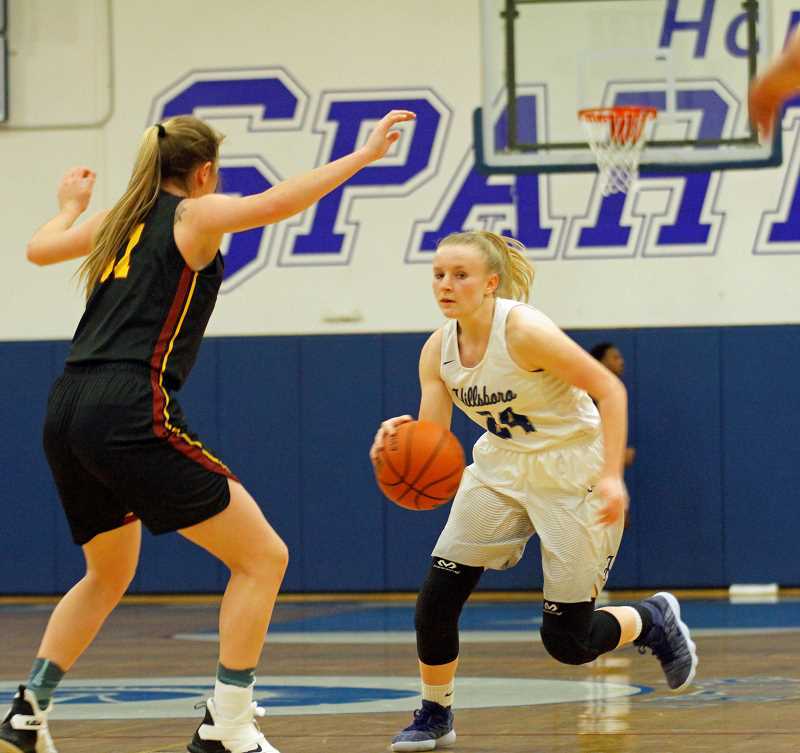 The Spartans raised their record to 4-4 in the NWOC and 10-8 overall, while Scappoose remained winless (0-8) in conference play and 1-16 for the season. The Indians had lost at home to Hillsboro 63-34 on Jan. 8, but they were able to applaud themselves for making the rematch more interesting. Some good plays and flurries kept them within striking distance early. "We battled a whole lot better, competed with them a lot better. I was real happy with some of the runs we made," Indians coach Sarah Mann said. Gaby Dague, Scappoose's hardworking 5-10 junior post, finished with 16 points and a game-high 12 rebounds. She was 6 of 13 from the field and grabbed nine of her boards on defense. "It was really fun," Dague said. "We just wanted this really hard, and we all went after it. We had some setbacks with fouls, but the bench really sparked us, and we worked so well together. "We really fought hard, and that's what I love about our team — we never stop pushing. I think we're getting get better, working together a lot better." Also for Scappoose, 5-8 senior point guard Sarah Mills scrapped her way to 12 points, six rebounds and three assists. "Sarah had a heck of a game for us. She just continues to attack," Mann said. "Great players never get tired, and she's a great player. She never gets tired, and she never quits. I love that about her." Off the Scappoose bench, 5-6 senior guard Payton Fisher chipped in with four points, four assists and five steals. But, as has been the case for the Indians in several games this season, the disparity in 3-point shooting held them back. Hillsboro connected on 7 of 27 long-range attempts while Scappoose was 0 for 6. "That's off-season work, developing as shooters. We'll get there," Mann said. The Indians had to overcome 11 first-quarter turnovers. They fought back a couple of times in the first half before going to intermission down 38-21. After Hillsboro jumped to a 9-1 lead, Scappoose ran off eight consecutive points to gain a 9-9 tie. The Spartans went up 19-11 early in the second quarter, but the Indians got to within 19-15, before Hillsboro took command with 15 straight points over a span of four minutes, 16 seconds. Porter had eight points and Kem six in that burst. "We knew (Porter) was a threat," Mann said. "They're a well-coached team. I like the way they get after it defensively." Porter was 9 of 11 at the free throw line and 5 of 8 from the field. "I like playing in the post, but I like facing up more. I really need to work on my post game," Porter said. She said the keys to the win were "really playing together as a team and talking a lot, communicating." Scappoose won the third quarter 13-7. Hillsboro stayed in control, though, with a 12-8 edge in the fourth. "We had a good first quarter, good first half," Harsin said. "The second half, I would like to have seen a little more intensity. But we finished strong."